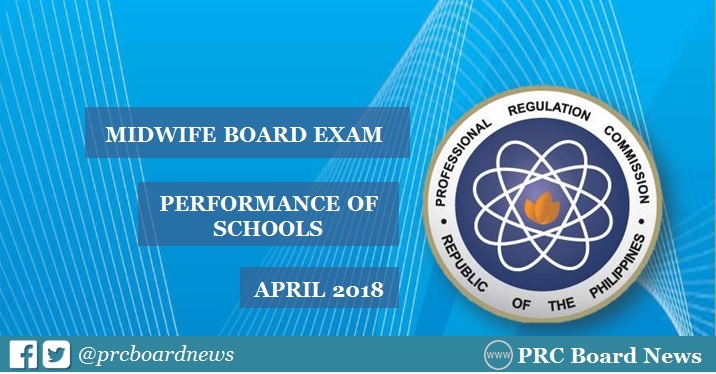 MANILA, Philippines - The Professional Regulation Commission (PRC) recognizes the top performing schools in the April 2018 Midwife board exam. The results are officially released on Tuesday, April 17, 2018 or in three (3) working days after the exam. PRC administered the Midwife licensure exam in the cities of Manila, Baguio, Cagayan de Oro, Cebu, Davao, Iloilo, Legaspi, Pagadian, Tacloban, Tuguegarao and Zamboanga on April 11 and 12, 2018. In the April 2017 Midwifery board exam, University of the Philippines (UP) - School of Health and Sciences - Leyte led the schools with 96.30% or 52 out of 54 examinees passed the exams. Camarines Sur Polytechnic College (CSPC) - Nabua placed second with 92.06%, 58 out of 63 passed the exams. Meanehile, CSPC-Nabua was the lone top performing school in the April 2016 midwife board exam, 59 out of 64 (92.19%). It's exceptionally miserable that she passed on out of the blue and this compose demise give extremely misery to the family since they not that their any part kicked the bucket in any minute. About the sudden passing numerous individuals have diverse feeling as like to go here let us know. So those needs to go on the last petition of her they should go and don't miss this. You do the decency that you share this eating routine arrangement with us since it's exceptionally important for our wellbeing, http://www.mbacapstoneproject.com/writing-winning-business-analytics-mba-capstone-tips-ideas-examples/ additionally share this compose data that identified with our wellbeing. Thus, I should pursue this to live fit and shrewd and not get the weight those individual have the high weight and lose this they should peruse this. Recently, went to our school with his mother for the confirmation and he was yelling a direct result of leaving the home. This movement from that youngsters recalled that me my affirmation day site of school when I did likewise action. The job of the dad is essential in the life of his children as he is the individual who can satisfy his children. He can offer joy to his children by giving them the offices of http://www.dentalschoolpersonalstatement.com/our-services/pediatric-dentistry-personal-statement/ getting quality training from great establishments. It is uncommonly captivating that you have shared practical tips with respect to prosperity. These tips will help to us http://www.pharmacypersonalstatement.net/faq-on-how-to-write-a-good-pharmacy-personal-statement/ and strong, I would moreover love to give these gainful tips to my friends. Since everyone should be strong.